In 1987 he won, by unanimous decision, the famous «Gabrielle Agostini» bursary. He attended master classes headed by Edith Fischer and became a brilliant virtuoso in 1991 when he received the first prize with 'very good' and congratulations from the jury. Landini is a member of the Swiss Society of Music Pedagogy. Shortly after he won a prize at the 'Orpheus' competition in Zurich. 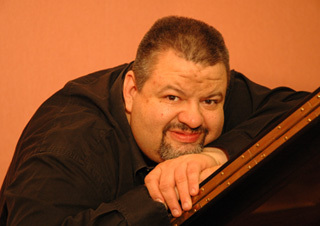 During more recent years he has performed in most of the major Swiss cities and abroad (Venice, Brussels, France, Italy, Germany and Bulgary), and for the swiss national radio broadcasting. Worthy of particular mention are his concerts at the prisons Bellechasse and Bochuz following an invitation by 'Musique / Espérance', founded by Miguel-Angel Estrella. Parallel to his concerting activities Landini also heads course in music history, aural training and work analysis for music lovers with no particular knowledge of music. He also heads the same courses at the conservatory in Neuchâtel. In 2004, the TV music channel Mezzo selected him as guide for the documentary: «Musical journey to french-speaking Switzerland: Helvetica», directed by Yan Pröfrök. From 2002 until 2006 he presents two programms on a local and private radio in Geneva:Radio-Cité. In 2007 he is artistic director for a Grieg festival on his own proposition organized by the academy of music of Neuchâtel (Switzerland) in tribute for the centenary of the norwegian composer's death.